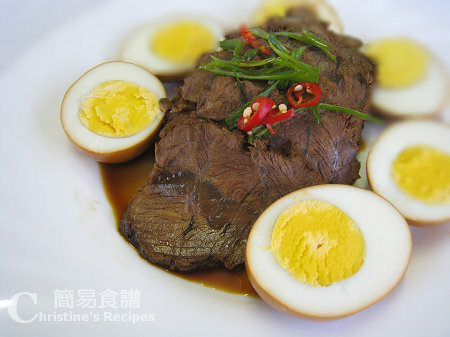 A reader of my Chinese food blog left a message to request the English recipe of this Spiced Beef Shin. How can I miss to translate this recipe? It’s a popular Chinese appetizer and my favourite snack. Some Chinese restaurants would offer this famous dish before main course. They would replace beef shin with braised tofu or peanuts for the sake of price, of course. I used to cook some in advance and keep them in fridge for serving at any time. It can be a very popular party food too. Remove the connective tissue of beef shin if any in order to have softer texture after cooking. Blanch in boiling water for 3 minutes. Drain well. Use a large saucepan and add all ingredients except beef shin. Bring to a boil. Add beef shin. When it boils again, slower heat to medium-low and simmer until softens. The sauce should cover the beef shin. If not, turn beef shin occasionally. Bear in mind that the cooking time is quite long, so you might like to use vacuum pot to save energy if you have one. Cook until sauce reduced and thickened. Remember to taste by yourself. Let beef shin cool completely and chill in fridge. Then you can easily cut into thin slices. This dish can be served cold or reheat to warm. Serve on a platter and pour (warm) sauce over it. The sauce can be kept in fridge for one to two weeks. Use the sauce to cook hard boiled eggs, chicken wings or peanuts. The taste of them is tremendously delicious too. Oh this sounds so good - one ingredient, fagara is new to me. Must explore to check it out. If I were using a regular cooking pot, approximately how many hours should it take for it to soften? I just went out to the store and only found the fagara ground powder. Do you think I can use that instead? Thanks again.. I can't wait to try out this recipe! Oh, you're very curious about fagara. 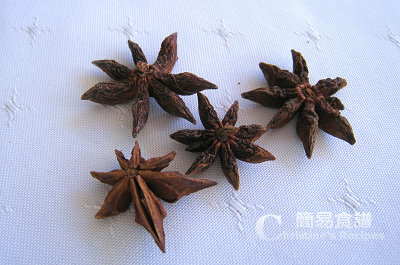 It's commonly used in Chinese cooking, especially for those spicy foods. Normally, it would take about 2 hours to soften the beef shin in a regular pot. You can test it with a chop stick. If it goes through the beef easily, it's done. I haven't used fagara ground powder before. I think it might have stronger smell. Try a bit first, then you can add more if needed. This looks amazing! Great flavours! Looks very delicious. I love eggs cooked in the stew sauce...mmmm. I don't mind eating 4 or 5 eggs in one go! Forget abt the cholesterol....once in a while is beautiful..hehe. 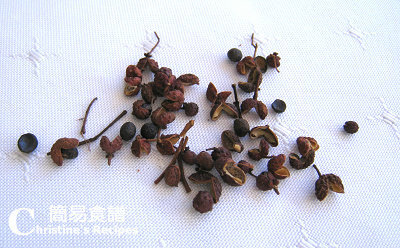 My mother-in-law likes to use fagara in cooking this dish to add a kick. The sauce is tremendously delicious after cooking meat. I also love eating eggs that cooked with this yummy sauce. my kind of food!! yummy. thanks for the recipe. Fantastic recipe. I tried it and it was truly yummy. Thanks for sharing!